It was Saturday afternoon and I was racking my brain for an idea for my next blogpost. The pressure was mounting since I try to post at least twice a week and the last post was on Wednesday … and then I Skyped with my mom. Voilà ! Merci maman ! It’s hard to think of a more iconic symbol of the United States than the Statue of Liberty. From postage stamps to commemorative coins to old New York state license plates to television and films, it is an unmistakable image that evokes America. Almost everyone knows that the statue was a gift from the people of France to the people of the United States, but the details of the story are always more fuzzy once we leave grade school. And most Americans aren’t aware that, right here in Paris, we have our very own replica one fourth the size of the original in New York. It was made by the sculptor using one of his design moulds and was presented to the city of Paris in 1889 by the American community living here to commemorate the centennial of the French Revolution. Just this afternoon, I ventured out to the Île aux Cygnes, a narrow island in the Seine just downriver from the Eiffel Tower, to take a look at the replica for the very first time. Having been inspired by my little afternoon excursion, I came home to finish up this post, the backstory of Lady Liberty’s 21-year voyage from idea to icon. 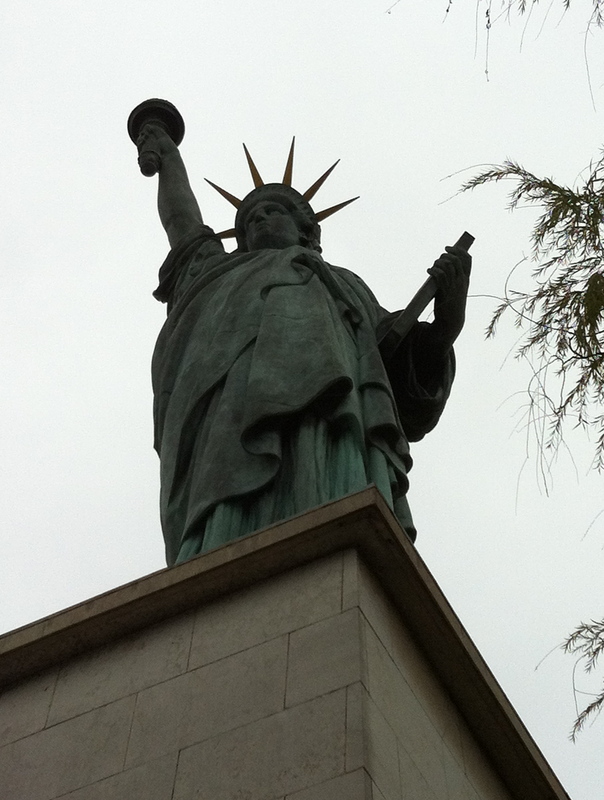 She was sculpted by Frédéric Auguste Bartholdi, a French sculptor born in Alsace and trained in architecture at the École National Supérieure des Beaux-Arts in Paris. He is known to Americans almost exclusively for the Statue of Liberty, though a park bearing his name near the U.S. Botanic Garden in Washington features a fountain he designed for the 1876 Centennial Exposition in Philadelphia. He also sculpted the statue of the Marquis de Lafayette that stands in Union Square in New York City. While the construction of the Statue of Liberty started at the end of 1875, the idea was actually born 10 years earlier at a dinner party hosted by French politician, law professor, and anti-slavery activist Édouard René de Laboulaye. 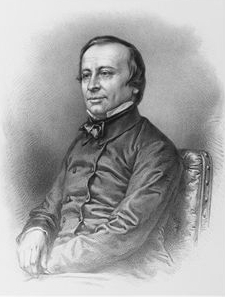 Laboulaye, who had been a staunch ally of the Union during the American Civil War, reportedly announced in reference to the recent end of the war that, “[i]f a monument should rise in the United States, as a memorial to their independence, I should think it only natural if it were built by united effort—a common work of both our nations.” Bartholdi, a friend of Laboulaye who was present at the dinner, was inspired by the idea. Needless to say, the political climate at the end of the 1860s was not ripe for a monumental, joint expression of liberty by Paris and Washington, so the project never got past discussions between Bartholdi and Laboulaye. That is, until something traumatic happened in France that cleared the way … Napoléon III’s next megalomaniacal idea: a catastrophic war with Prussia. 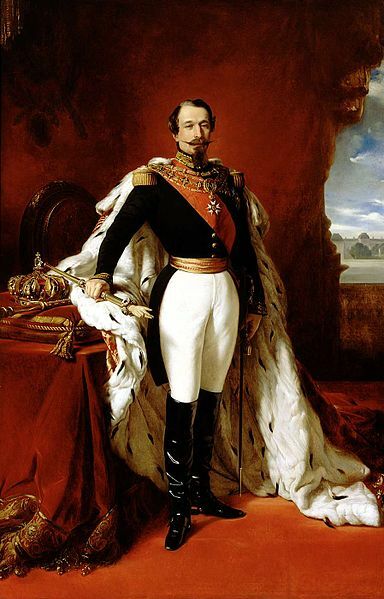 The Emperor’s bad judgment this time resulted in a humiliating defeat in 1871, for which he was deposed (and replaced by the Third Republic) and for which the French nation lost Alsace and Lorraine—Bartholdi’s family home. Faced with all of these new realities, Bartholdi and Laboulaye decided that the time was right to pursue their project. 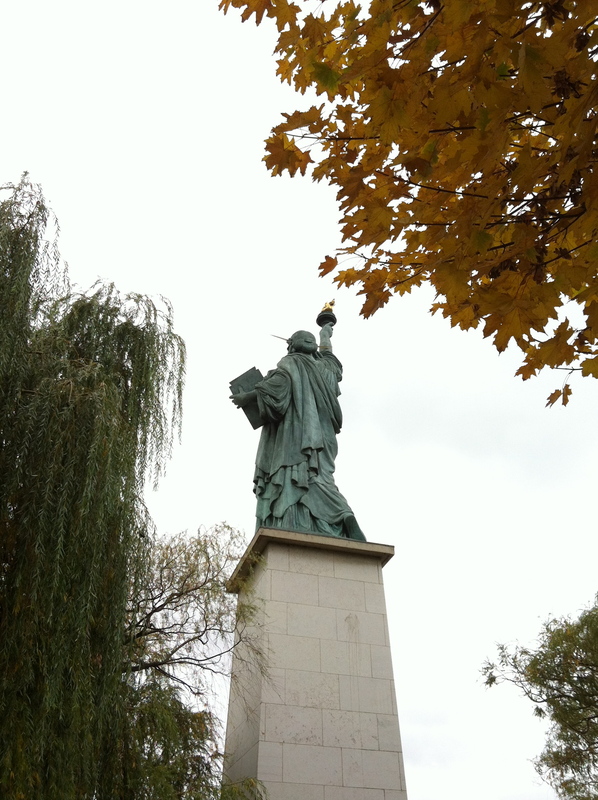 Later that year, Bartholdi arrived in New York City with letters of introduction from Laboulaye in hand. From the moment he first sailed into New York harbor, Bartholdi was fixated on Bedloe’s Island (now Liberty Island) as a possible site for the monument. He wrote in his journal after seeing the island for the first time: “Surely it is here that my statue should be raised, here where men first perceived the New World, here where liberty casts her radiance over both worlds.” Okay, so he was a little confused regarding where men first perceived the New World, but he was right that it would be a good site because of its proximity to shipping lanes in and out of New York Harbor. After all, if you’re going to build a 151-foot tall statue on 305-foot tall pedestal, you want to put it somewhere it will really get noticed. Bartholdi spent the next few years splitting his time between the United States and France meeting with officials and gauging financial support for the project in America, designing the statue in both America and France, and working on other projects … like the Bartholdi fountain for the Centennial Expedition and getting married to a Frenchwoman, Jeanne-Emilie Baheux Puysieux, in Newport, Rhode Island of all places. Laboulaye viewed the post-war improvement in the French economy and growing interest in the Centennial Exposition in Philadelphia as signs that it was high time to start asking for money. 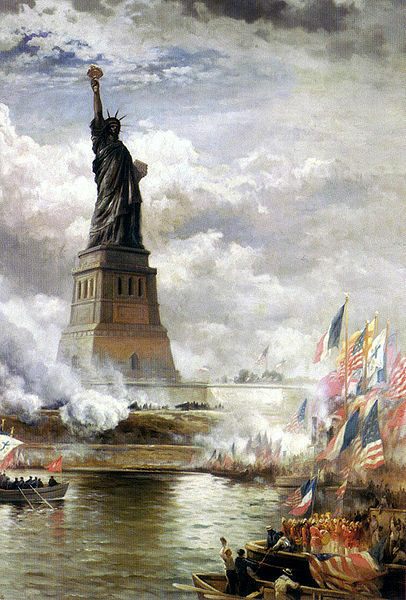 In 1875, Laboulaye formed the Franco-American Union as a fundraising organization and officially unveiled the project to French society: a gift from the people of France to the people of America celebrating the centennial of their independence, a statue entitled La Liberté éclairant le monde (“Liberty enlightening the world”). 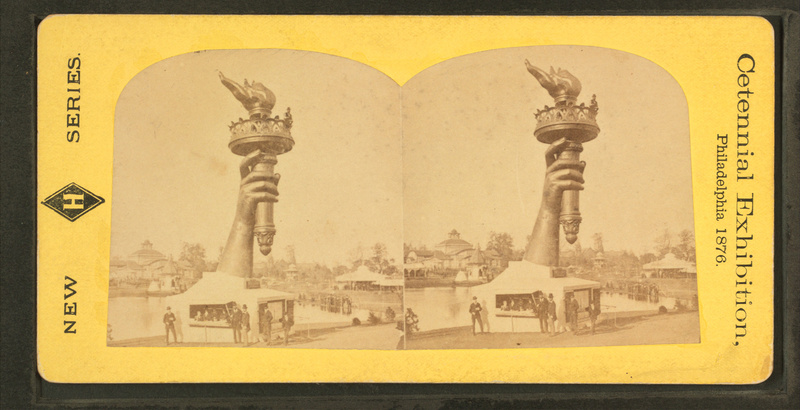 Bartholdi traveled back to the United States once again in May 1876 as part of the French delegation to the Centennial Exposition in Philadelphia. In addition to several other works, he exhibited the statue’s recently completed arm and torch. 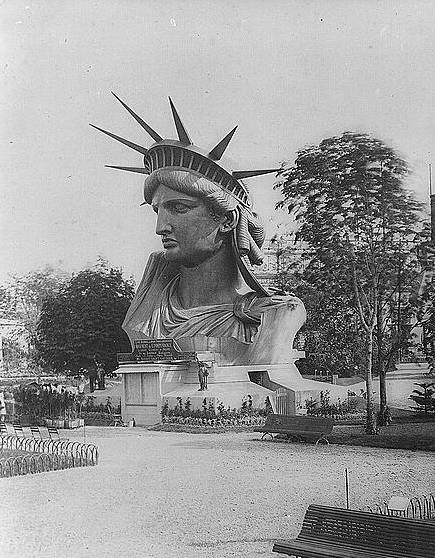 Because it arrived late, however, it was not included in the catalog and was misrepresented in some reports as “The Colossal Arm” and “Bartholdi’s Electric Light.” After the Exposition, it was moved to New York City, where it remained in Madison Square Park for several years before being shipped back to France for the final assembly of the statue. After that, needless to say, there was a lot more design and construction. The head was completed in time to be exhibited at the 1878 Paris World Fair, which increased interest in the statue as well as donations for its completion. 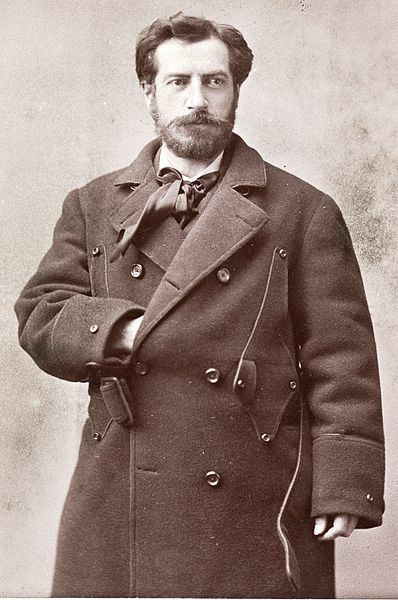 In 1880, after the untimely demise of one of his engineers, Bartholdi engaged the services of the innovative designer Alexandre-Gustave Eiffel (of Eiffel Tower fame, of course) who proposed a major design change: the use of an iron truss with “armatures” for the interior frame instead of bolting the copper exterior to a masonry pier. Now, I won’t go into an engineering explanation (#1 because I’m not qualified, and #2 because it’s boring), but this was a big deal. It meant that the statue’s copper exterior would not be load-bearing, so it wouldn’t get stress fractures from supporting its own weight. More interestingly for me, it meant that Bartholdi wouldn’t have to place the cooper exterior on the statue onsite in New York as the masonry pier was constructed; instead, he could complete construction in Paris, disassemble the finished work, and ship it in pieces for a final reassembly on the pedestal in New York City. And that’s exactly what he did … after waiting for a little while. 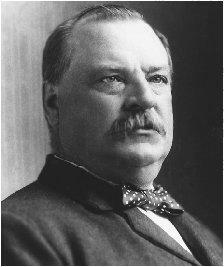 Grover Cleveland: Cheapskate or Master of Timing? While the statue was completed in Paris in 1884 and was formally presented to the American ambassador on July 4 that year, it couldn’t be shipped to New York right away because the pedestal wasn’t ready. You’ll recall that I said earlier that the statue was a gift from France to the United States. The pedestal, on the other hand, was our responsibility. To put it bluntly, back in America, we just couldn’t get our act together. Political head-butting between Republicans and Democrats in Congress frustrated federal appropriations for the project, and the governor of New York, Grover Cleveland, vetoed a bill appropriating funds from the New York treasury. Funding remained largely private, and despite the fact that fundraising efforts for the pedestal had been headed up by charismatic young Theodore Roosevelt (future New York governor and American president) since they started in 1882, pocketbooks just weren’t opening. It was only after publisher Joseph Pulitzer announced that he would publish the name of every contributor to the project, no matter the size of the donation, that private donations surged, motivated by stories like that of a group of children sending “the money we saved to go to the circus with” and that of a kindergarten class in Iowa sending $1.35 towards the effort. 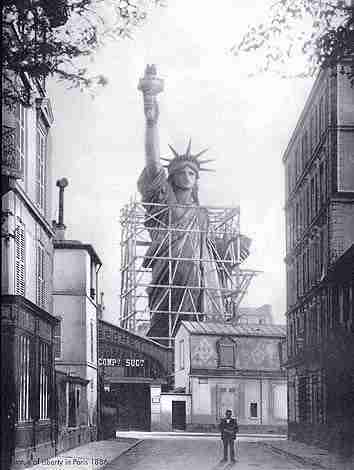 As a result of the delay, Lady Liberty had to sit (well, stand) in Paris, waiting until enough progress had been made on the pedestal to warrant shipping her overseas. Finally, beginning in February 1885, she was disassembled into 350 pieces, boxed into 214 crates, and shipped by train to Rouen and then by boat to Le Havre, where her 120 tons of iron and 80 tons of copper were loaded into the French frigate Isère. The process took three whole months! When the Isère arrived in New York harbor on June 17, 1885, it was greeted with triumphal fanfare. Even so, the pedestal wasn’t completed until April of the following year. And then the reassembly started tout de suite. Finally, on the afternoon of October 28, 1886, after six months of reassembly, the Statue of Liberty was unveiled. The ceremony was presided over by the President of the United States, Grover Cleveland … um … the former governor of … uh … New York, who had … yeah … vetoed that appropriations bill for funds to help build the pedestal. Yeah. Okay, so maybe it was all just a ploy to delay construction long enough so he could become President and unveil it? In any case, during the ceremony, the face of Lady Liberty was hidden behind an enormous French flag which was to be lowered by Bartholdi himself (stationed inside the crown of the statue) at the end of a speech given by Senator William Evarts of New York. However, Bartholdi mistook a prolonged pause in Sen. Evarts’s speech as the end, and he prematurely lowered the flag to the thundering applause of the assembled crowd, not to mention the spectators observing the unveiling from boats in the harbor. That marked the premature conclusion of Sen. Evarts’s address, of course, but it marked the birth of a new American icon, one that would become with the passage of time as emblematic of the United States as the Eiffel Tower is emblematic of France. ← Cold War on Line 7?